Want to be the controller of any dices games? Please don't doubt that the remote control dices can help you to dominate any dices games for the point of dice could be the number you wish. 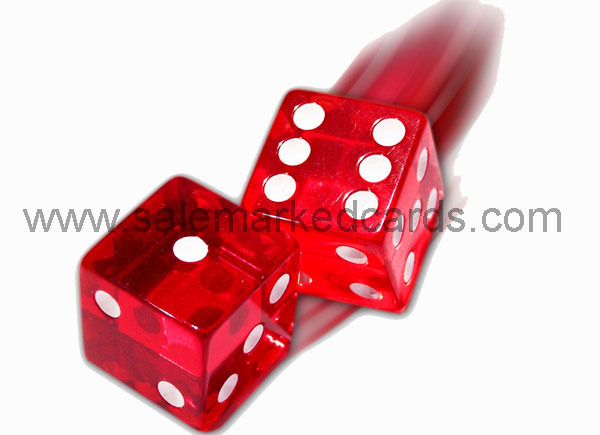 With our remote control dice, you can always get the points whatever you want the dices to be. What you need to do is pressing the button of the remote control without others' notice, so as to always win the games. Some guys said to need the remote control dices without the remote control board. That doesn't work to make sense at all. The remote control dices must work on the special board with remote control. If you don't want to buy the board, you can consider the mercury dices or loaded dices and induction dices. For every remote control dice, we can control two numbers, such as 1 and 6. The technicians may install a small piece of special magnet inside the dice, with its positive electrode and negative electrode pointing to the two numbers (1and 6, 2and 5, or 3and 4). Then you can control the two points on a magnetic board with the remote control. If you want it to be 1, you press the positive electrode. And when you press the negative electrode, it will be 6. 2 and 5, or 3 and 4 works the same like 1 and 6. One or two or more remote control dices can work in the same remote control board, which makes this great products can suit for any dices games. Take the dices in the video for example, 3 dices work in the same time, if you want it to be low points 1+2+3, just press A on the remote control. if press B, it's 6+5+4 of the dices in the video.